This first line beach holiday apartment for rent with the exceptional location offers stunning sea views. With maximum capacity of up to 4+1 people, the place gives a relaxation vibe and has everything you might wish for your perfect vacation. The outstanding sensation of being in the middle of a vacation paradise comes from the connection of sea, sun and beautiful surroundings including spectacular sea and Marina views. Master bedroom of this holiday apartment for rent offers a comfortable king size bed, the second bedroom has two single beds. 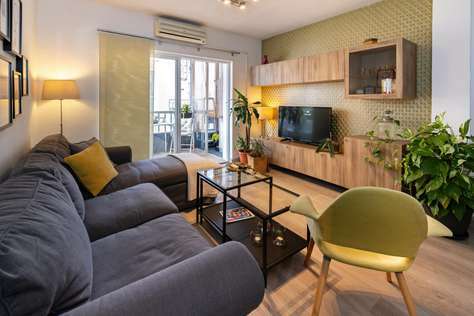 Fully equipped kitchen opens into a spacious living room and further into a balcony with an outside dining area, overlooking Fuengirola Marina and Promenade. is located in the well-known Perla 4 building in front of the beach Playa de Santa Amalia in Fuengirola. The apartment features bright and spacious living room with flat screen TV, and two bedrooms. The living room is divided in two areas, seating area with leather sofa bed and flat screen TV and dining area. Dining area sits 6. Fully equipped open plan kitchen opens further into the spacious living room. Floor to ceiling windows of the living room lead to the balcony with outside dining area and spectacular panoramic sea views. TV, pull out sofa area and a dining table for 6 people. 2nd bedroom: 1 bunk bed + wardrobe. Fully equipped kitchen: oven, microwave, induction stove, washing machine, fridge, toaster, coffee machine, kettle, juicer and blender. The apartment also has an iron and ironing board. 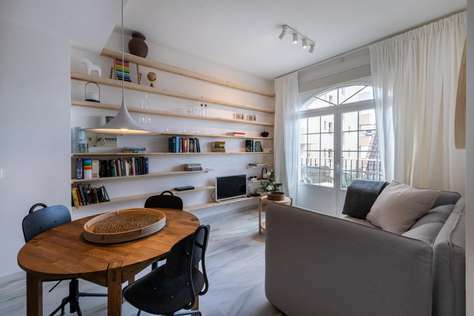 The damage deposit for this apartment is 100 euros. Telephone is available for national calls only (free national calls). Baby cot, highchair and baby bath are available (included). Baby cot, highchair and baby bath are available (free). 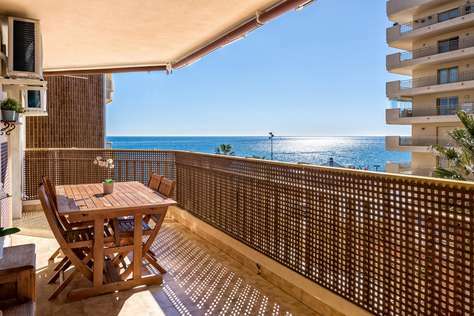 Holiday beautiful penthouse for rent in Benalmádena. 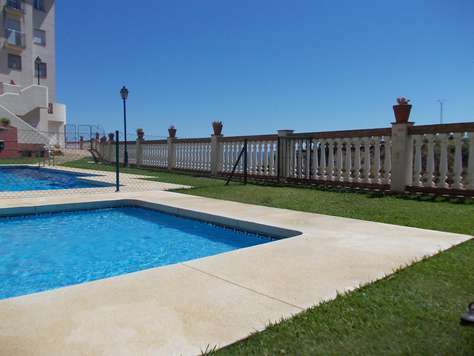 Fantastic 2 bedroom 2 bathroom Beachfront Penthouse in Carvajal, Fuengirola, with a Communal Swimming Pool , amazing sea views from it's private balcony and the beach literally a stones throw away. This apartment is all about being the absolute ideal apartment for a beach holiday in summer time as it offers the best location, where you are only metres away from the golden sandy beaches of Fuengirola and still have a lovely cool swimming pool to use when you want a change from the sea but still want a cool dip. This apartment has 2 bedrooms, a spacious lounge, fitted kitchen, flat screen TV and fibre optic wifi internet. The private balcony overlooks the golden sandy beaches and surf. There is also underground garage place should you hire a car, though you certainly don't need one here, as the apartment is still only a 5-10 minute walk from Torreblanca or Carvajal Train Stations which run efficiently, comfortably and affordably between Fuengirola Town Centre and Malaga Airport (and beyond in fact). There are two swimming pools nearby for your choice, you can use any of them as the building belongs to the both. 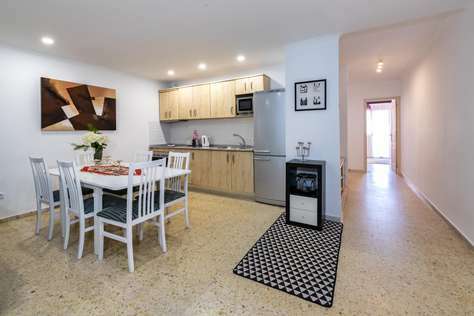 The apartment offers 2 bedrooms, 1 bathroom, dining area, fully equipped kitchen. The beach of Carvajal is one of the most famous and popular beaches of Fuengirola. Located to the west of the center, it extends until entering the municipal term of Benalmádena.This is a beach that has all the services you need. The sand is dark, and the depth is very low, making it ideal for children. Being an urban beach, in high season it is usually filled quite a lot. It is not the most beautiful beach on the Costa del Sol, but it is a clean and well-maintained beach with crystal clear waters.Among the services that this beach offers, you can rent umbrellas and sun beds, it has a lifeguard post, access for the disabled, showers and public toilets. 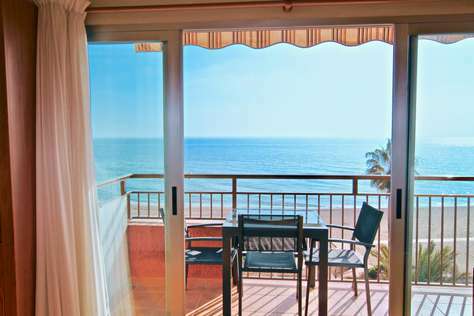 3 bedroom Holiday apartment on on the first line to the beach for rent in Fuengirola. 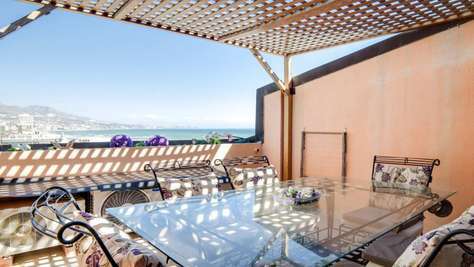 This first line beach holiday apartment for rent with the exceptional location offers stunning sea views. With maximum capacity of up to 6 people, the place gives a relaxation vibe and has everything you might wish for your perfect vacation. The outstanding sensation of being in the middle of a vacation paradise comes from the connection of sea, sun and beautiful surroundings including spectacular sea and views. Master bedroom of this holiday apartment for rent offers a comfortable king size bed, the second bedroom has a queen size bed, the third bedroom features 2 single beds. 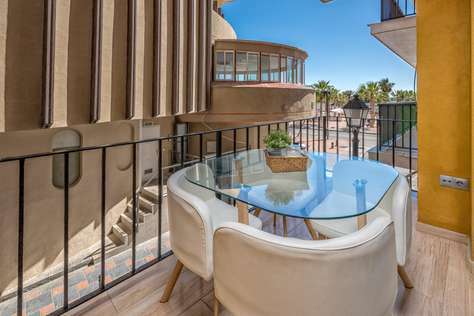 Fully equipped kitchen opens into a spacious living room and further into a balcony with a lounge, overlooking Fuengirola Promenade.